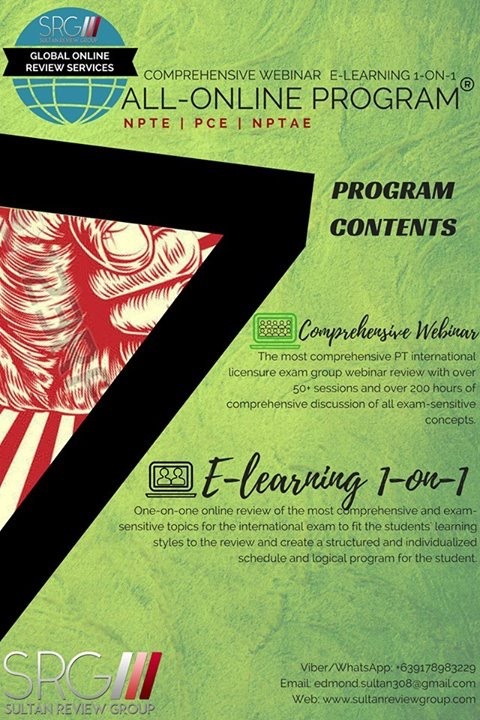 ALL-ONLINE Review Program for the NPTE, PCE, and NPTAE! Why get the benefits of just one program when you can win with two? SRG introduces to you one of our review bundles: Worldwide Comprehensive Webinar with E-Learning 1-on-1 program! Join the most complete and comprehensive group webinar review for the the NPTAE, NPTE, and PCE. Developed with fixed Schedules: Mon-Tues-Thurs-Sat. 6pm (Pacific Time), 9am (Philippine Time), 4-5 hours per session. Best coupled with the individualized one-on-one online review program. A review program specifically tailored to your learning style, pace, availability, and preferences, specifically designed to give you convenience. Previous Entry:ALL-WEBINAR Review Program for the NPTE, PCE, and NPTAE! Next Entry:SRG’s global online services!